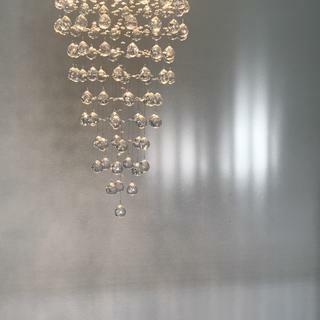 Crystal glass cascades beautifully from the chrome finish frame of this adjustable chandelier. This enchanting chandelier has a pouring crystal design for distinctive dazzle and shimmering shine. Completed with a sleek chrome finish for a truly stunning look. 40 1/2" high x 18" wide. Canopy is 5" wide x 2" high. 10-feet of cord. Sloped ceiling adaptable. Weighs 29 lbs. Includes seven 50 watt GU10 halogen bulbs. 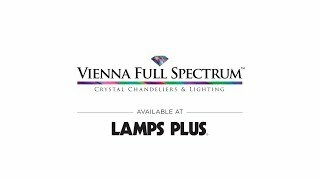 From the Vienna Full Spectrum™ collection of crystal lighting. Inspired by bubble chandelier designs. 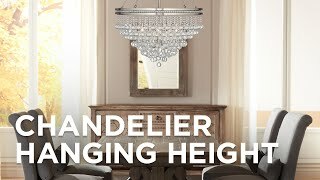 Large chandelier size for entryways and more. With crystal glass globes. Chrome finish accents and canopy. It’s pretty, graceful, shiny and perfect for my updated foyer. 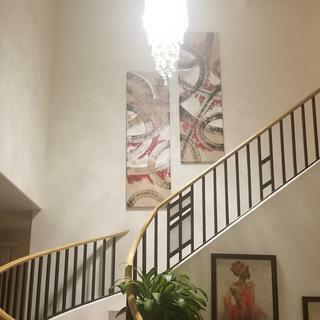 Because it is fit and looks nice, modern and classy for top of the stairs. 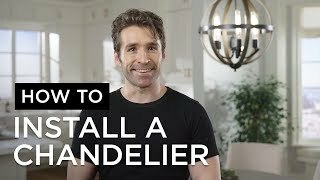 What is the total minimum hanging length for the fixture and cables? BEST ANSWER: Hi, the minimum hanging height is 53" inches. If the length of the fixture is 40.5 inches from the bottom to the top, how long are the suspension cables on top of that? Total length from ceiling mount to the bottom of the crystals. Thanks! 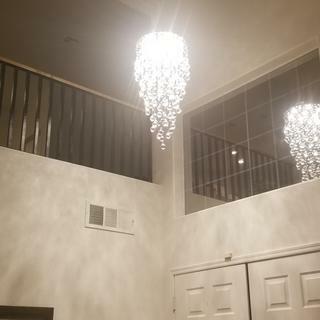 BEST ANSWER: Hi - the height of just the chandelier without the cables measures 40 1/2". You then have the 10 feet of adjustable cord to add to that with a total approximate overall hanging height of 160 1/2". 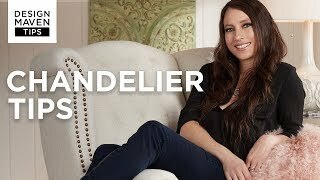 Is the 40 1/2 height a measurement from the flush mount to the bottom of the chandelier or is the 40 1/2 the fixture only and does not included the hanging cables? BEST ANSWER: Hi, the 40.5" inch height is from the bottom of the crystals to the top of the frame where the suspension cabled attach. Okay. Can you tell me how long the suspension cables are from the flush mount to where they attach to the chadelier. Hi, it includes 10'ft of suspension cable. 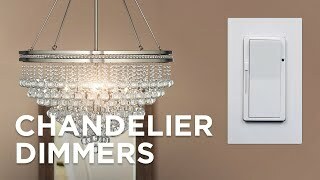 Can bulbs be switched to LEDs? 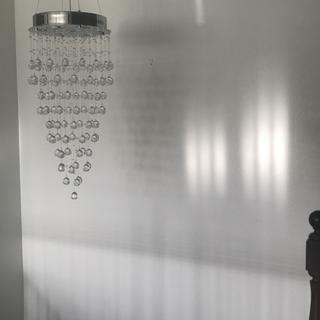 BEST ANSWER: I'm fairly certain I ordered LED bulbs at the time of ordering this fixture and when I had it installed I had the LED bulbs also installed. 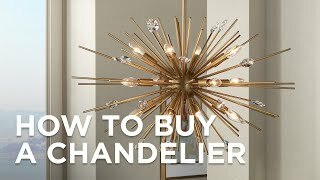 I absolutely love this fixture and I have it in my entryway. I get comments on it all the time. Are you able to request LED bulbs instead of what it comes with or did you order them in addition to what comes with the product? This already includes halogen bulbs, but you may purchase LED bulbs separately. You can use LED bulb Style #40X95. Thanks for your response Dan. When I google "LED bulb Style #40X95", I am not finding any suitable match. Will GU10 work ? If yes, what wattage per bulb and how many bulbs should I buy? Hi, style# 40X95 is an exclusive bulb we carry. Any GU10 LED light bulb will work. 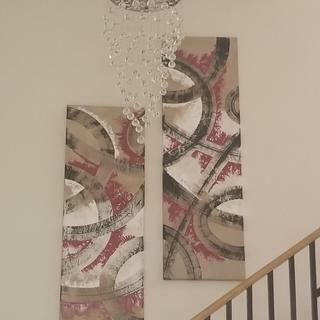 What is the total length of the flush mount Aida crystal Chandelier? BEST ANSWER: Hi - the total length of the fixture is 40 1/2" high, but includes 10 feet of adjustable cord. I have a sloping(rooftop ceiling ) not even ceiling will it work to hang ? BEST ANSWER: Yes - this is slope adaptable. Yes, it could work. It has adjustable wires that can make it hang correctly on a sloped ceiling. The wires could also be adjusted for the right height at the same time. What is hanging height over a free standing rib? BEST ANSWER: With the included 10 feet of cord, this will have an approximate maximum hanging height of 160 1/2". It says it has 10' of cord. I need this to hang 6' from the ceiling to the mount. Will it work? BEST ANSWER: Yes - the 10 foot cord is adjustable. 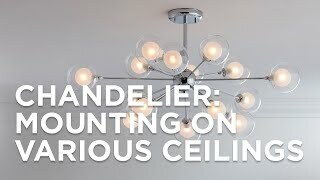 Can the pouring crystal chandelier be mounted on a sloped ceiling? Can this light be mounted flush to ceiling? BEST ANSWER: No, this was designed to be hung as a chandelier. But, the collection does have a matching flushmount Style #X9149. Can this light be put on a dimmer switch? 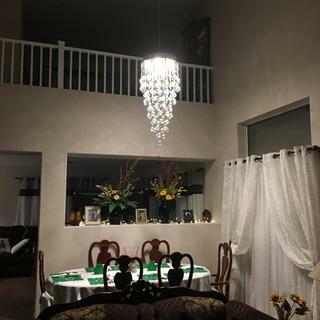 BEST ANSWER: Hi, the chandelier can be used with a dimmer switch. yes, mine is on a dimmer. Can this be hung from a slanted ceiling? BEST ANSWER: Yes, this design is sloped or slanted ceiling adaptable. Will it work for cove ceiling? BEST ANSWER: Absolutely. And you might consider adding a ceiling medallion to increase the scale and drama of this stunning pendant! It is possible to install this item on a vaulted ceiling of perhaps 20-25 degrees. The cables would need careful adjustment to hang the light and crystal panel perpendicular to the floor. Can this be suspended on a wire in a 2 story ceinlng/entry? Yes, it comes with a long wire for that purpose. It is absolutely gorgeous! 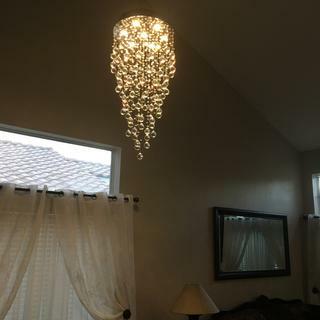 This light fixture has completely transformed the room. Strikingly gorgeous! 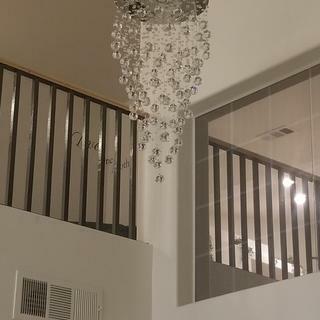 Crystal is in good quality and looks breathtakingly dramatic in my 2 story living room. Key is to hang it right and I have other objects in the room for it to reflect off of. A mirror on top of fireplace and some acrylic frames that serve as a perfect vessel to carry on its beauty from every corner of the room. Save you some guess work, rent a 12’ scaffold from Home Depot. I got a 20’ ceiling but hung on a slope which is 19’ up. Drop the big canopy down 6’6” from the ceiling and none the wiser. Tedious to put together but I am not complaining as I got a chance to inspect every single crystal ball. Wear gloves today not leave finger prints. Put it on a dimmer and enjoy it on different levels of brightness, plus I save a few bucks, too, on these halogen lights. Overall: this chandelier got a 10/10 from a perfectionist like me. 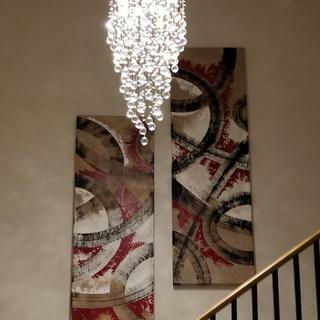 I love this beautifully designed chandelier. I love the warm lighting of the light. 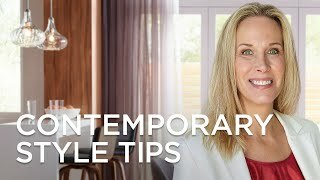 My only complaint is that if you have a house where you can see over the top of the chandelier, the circular top is made of material that looks cheap. 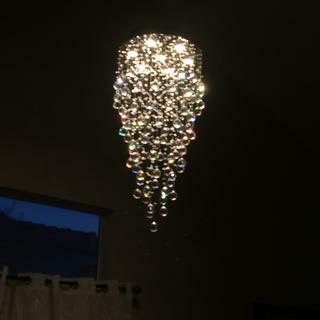 We bought two of these beautiful lights for our entry way. They add a lot of extra sparkle to our house and are nice focal points. Strands of clear crystal are arranged along a chrome finish wave bar for a stylish look in this contemporary style pendant. Glamorous and decadentthis contemporary 12-light crystal chandelier offers your home supreme elegance. Swooping arms of clear crystal and black shades give this large transitional chandelier undeniable glamour. 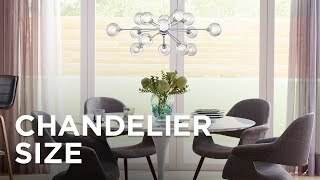 Bring a spirited addition to your favorite living space with this modern multi light swag chandelier.